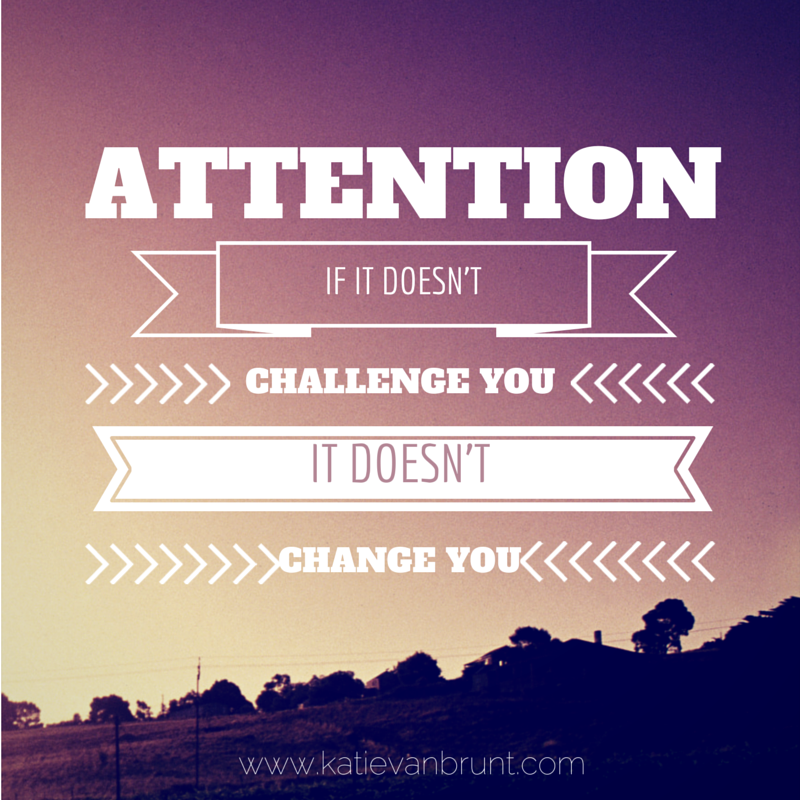 ATTENTION: If it doesn’t challenge you, it doesn’t change you. I’ve been thinking a lot lately about the latter statement. It applies to a couple different situations in my life. The first one being: I like friends who challenge me to become a better person. I don’t want superficial friendships, where my conversations are merely floating on the surface. I want to sink deeper. I don’t want friends who only tell me things like, “That’s a cute outfit.” Sure, it’s nice to be complimented, and I’m not asking my friends to stop being sincere in that sense, but I want more. I have come to realize that sometimes I may come across as–I dunno–strong? (…overpowering, maybe??) in conversations, but that’s because I like to challenge my friends, too. Not in a Ichallengeyoutoadeathmatch sort of way, but in a I challenge you to be a better YOU sort of way. I’ve also come to realize that some people just aren’t ready to be challenged and make life changes; and try as you may, there’s just nothing you can do about it. Man, this really saddens me. When I see people slipping down a path that is dark and scary, I become anxious, and my passion rises. I have been in a dark place. I know that you don’t initially think it’s a dark place, because you can only see one step in front of you. But then things start to unravel. And that’s when it’s harder to get out. It’s like running in the mud. On the surface you see a shallow puddle and think, “This will be easy to cross. I don’t need any help.” But as soon as your feet hit the mud, you start sinking. You realize that it is a lot harder than you ever could have imagined, and you wish you would have come prepared. You wish you had a plan. You wish you had a support-system in place. You wish you had the right equipment and gear to help you through the tough spots. Are you going through a rough time in your life? Do you want to know why things aren’t getting better? It’s because you are not making changes in your life. You’re only planning to get through a puddle, while you should be preparing for a mud run. Yes, it is hard to make changes. There’s no doubt about that. But if you want to have a better quality of life, you have to take the first step. It’s scary. I know. I know... But I promise you it’s worth it. I cross my heart to you that it’s so worth it. I challenge you to make the changes you need. What is something you want to change in the near future? Do you know what changes you need to make to get there? Do you have a support system in place?